...Which led to my now having before me a small packet of seeds of the exceedingly rare tomato relative Solanum sisymbriifolium-- a bit more on Wikipedia under that name, if like me you've never heard of it before. A quick search under the species name, and under "Morelle," discloses that apparently, only 2 Tomatovillians have ever posted anything about having grown this species, and haven't really written anything about it. I'm wondering if they or anybody else has any more information to share about it. I put this thread under Tomatilloes because it seemed like the most logical place to put it. Tom Wagner sells it, and this is his description. …I quite like it. Yes, it is a seedy fruit but like raspberries, I don’t find this gets in the way of my appreciation of the fruit. The flavour is somewhat cherry like, I suppose, definitely fruity. I’ve heard others say the same thing, “cherry-like”, some going so far as to make pies out of the fruit. The fruit grows on a vaguely tomato-like plant, more open, but spiny unlike a tomato. Unlike a tomato, it requires cross-pollination so grow at least several plants. It is also hardier and longer-lived than a tomato, and may survive mild dryish winters. Tom and I have some plants that seem to be surviving the winter. CAN BECOME WEEDY IN CLIMATES TO ITS LIKING. If it survives the winter, the second year it can turn into a spiney monster that poses a bit of a maintenance hazard. I’ve heard of people using the spines to advantage by planting it as a seasonal obstacle to animals or humans. That said, it’s quite attractive, with white or preferably pale blue flowers and fruit that turns bright geranium reddish-orange when fully ripe." I don't need any more thorns on my property, so I passed. I like it too and I grow it every few years. It does have a fruity flavor to it with nice sweetness. Lovely flowers too! Hate the spines though, they sure are prickly. You should start the seeds way before tomatoes because they take long to germinate. Ore use the wet kitchen towel trick. That works mighty fine. Here are some of my photos so you know what to expect. Thanks @ both who have replied so far. This species is looking more interesting as it goes along. Litchi tomato does surprisingly well even here, although it could do even better if I had another month. I grow "Morelle de Balbis", which was sent to me from Will Weaver in 2006. It is very free flowering & attractive in bloom, and it blooms non-stop until frost. The foliage is pretty too, it would be a good ornamental if it wasn't for the thorns. This is a highly vigorous, indeterminate plant. Left to its own devices, it will sprawl across the ground 4-5 feet in all directions, and would be a navigation hazard. Even here, the base of the stem will be about 1"-1.5" wide when killed by frost; so where it might survive the winter, heed Janezee's warning. It is best to train it upward, so you can reach underneath and have at least some hope of harvesting without injury. DO NOT plant this where young children might have access to it. Don't plant it next to a path, either... unless you have neighbors who like to steal your veggies in the dark. When the fruit is ripe, the thorny calyx will peel back. Some of mine separate very easily at this point, others still require a good pull. For harvest, gloves (preferably with gauntlets) and long sleeves are recommended. The spines are plentiful & very sharp. The skin of the ripe fruit has the same "tacky" feel as a ripe cherry, and the predominant flavor is cherry-like, with hints of other flavors. Usually mine have hints of gooseberry, but I had some last year that were peach-like. I wanted to save seed from that plant, but left the berries in a bucket outside, and it was destroyed by rain. The fruit seems to have its best flavor in the cool(er) days of late Summer. Usually the wife & I just eat them fresh, since I can't quite get enough to process in my short season. But I did add them to apples I was cooking up for jelly, and it added a wonderful flavor to the jelly. Disappointingly little of the red color transferred to the jelly, though. CAN BECOME WEEDY IN CLIMATES TO ITS LIKING. Since it volunteers here freely, I'd say it must like any climate where it can grow to maturity from seed - and if it self-seeds here, it will probably do so in most of temperate North America. I don't have to plant it, just move the volunteers to where I want them; but I'll get more fruit with transplants. I was concerned that birds might spread the seed, but they don't seem to be interested in the berries. One other observation. Litchi tomato seems to be a good trap crop for Colorado Potato Beetle. They bypass my eggplant & attack the Litchi tomato. In the open foliage, the larvae are easily found, and I dispatch them with soap spray. The plant is too rampant to be damaged by them anyway. Am I ever glad I took a pass on this! And I thought the 200 square feet of Himalayan blackberries I took out last year were tough! Petronius, really, are you listening to all this? Does this sound like a good time? "Interesting?" Is that what you said? Like rattlesnakes "interesting?" More like "common garter snakes interesting." Garter snakes may chase away rattlesnakes, they eat rodents, and they don't like to bite humans. I love baby garter snakes. They look like worms to me. They have great potential as a practical joking tool (as long as the joke wouldn't be harmful to the baby snake). Lee Goodwin of J and L gardens sells the Litchi tomato. He is in Espanola, NM. I love garter snakes! When we bought our 1813 house on Cape Cod, it came with a resident snake in the cellar/crawlspace. We left him alone, and all were jolly. One night, we were out for a walk on our country road, and found a flattened snake. Within a week, we were overrun with mice. Didn't know how to attract another snake to stay, so we got a cat who was a marvelous mouser. Then we got two kittens to keep her company. They used to play ice hockey with mouse heads in the driveway. I wish I had a picture, but the mind's eye can still see pretty well. Great pics, Iva. Are those yours? I've never seen them. They're really pretty. 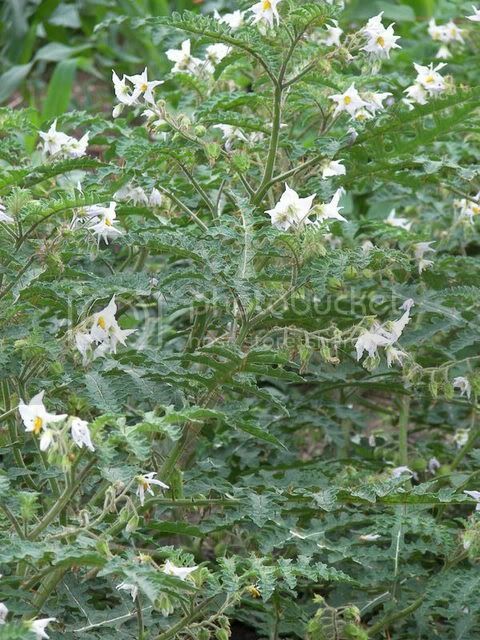 I just registered to this forum because I found this thread while googling Solanum sisymbriifolium. It took a while to get my account moderated, too. I'm growing it for the first time this year, and I'm super excited! My little seedling is about eight weeks old. It has three decent-sized adult leaves. I've had two of them start out of maybe thirty four-year-old seeds I've tried to start, and the other one died. Over the past couple months I've become an internet expert on this plant. The husks around the fruit make you think of Physalis species, tomatilloes and groundcherries, but S. sisymbriifolium is in the nightshade genus, Solanum, with tomatoes, potatoes, and in the same subgenus, Leptostemonum, as eggplants. Like has been said, S. sisymbriifolium can be invasive, and it's naturalized in South Africa, parts of Australia, and the Southern U.S., outside of its native Chaco region in South America. S. sisymbriifolium doesn't seem to be a plant that has ever had a place in traditional cultivation. In what I imagine is a consequence of its not being stabilized through breeding, I've heard contrasting descriptions of the taste of its fruit, and since I got my seeds from someone who didn't know it was edible, I'm scared mine won't taste well. Even in light of this plant's weedy nature, I'm a little bit enthralled by its looks--the spines, the shape of the leaves, the flowers, the fruits--and the fact that it's useful to human beings. If I had more space I'd like to refine a strain myself. Maybe we can get a good thread going about growing this plant for this summer and talk about our results when they come to fruition. Anyway, here is my two-month-old plant. I noticed today that the leaves showed a clear progression from rounded to fern-shaped. Last edited by Kierkegaard; March 9, 2012 at 10:46 AM. Yes, the pics are mine! They were taken in 2008 when I grew litchi tomato for the firts time. I'm growing it for the first time this year. I'm growing it again this year. It really is a beautiful plant...and, if placed strategically, it can detour varmits and thieves!!! I have seed for this if anyone wants to trade! My single specimen is going absolutely crazy now. It's so big. I can't wait til fruit.